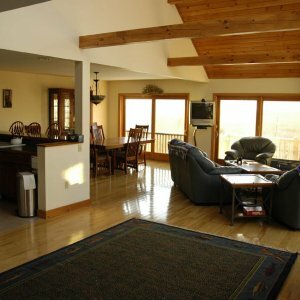 THE HEIGHTS: 10-bedroom, beautifully appointed home minutes from Sunday River Resort with a spectacular view! CARIBOU RUN: 6-bedroom home. Perfect for two families. See www.caribourunmaine.com. Lovely view too. Hovering high upon the beautiful Sunday River's Powder Ridge, The Heights provides you with an extraordinary view of the Mahoosic Mountain range. The Heights is a spectacular, 8000 square foot, contemporary home with 2000 square feet of glass frontage, privately situated on five acres of woodland to maximize serenity and seclusion. The Eagle's Nest and The Bobcat's Den, which can be rented as a complete entity or independently. Its unique design allows for free flowing multi-level living as one full unit or two separate locked-off units with completely private entrances. The units are completely different, yet uniquely spectacular and fully soundproofed. The goal of this design is to provide luxurious accommodations for small corporate retreats or for large family get-aways. CARIBOU RUN is a beautifully built 4200 sq. ft. home nestled into private acreage near the historic town of Bethel. It is furnished with handsome, comfortable furniture and appliances and a well-appointed open-floor plan catering to either 1 or 2 families.